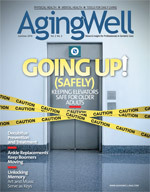 Communicating to older adults the real prospects for significant injury and raising their level of caution are critical to elevator safety. Stand near any elevator—whether it’s located in a hospital, shopping mall, casino, or long-term care facility—and you’ll notice a common trend: People jostling their way into it, using their hands to negotiate the door or, in the case of older adults, having their walkers or canes get stuck as the elevator doors close, resulting in frequent injuries. The fact that more older adults are sustaining elevator-related injuries should come as no surprise, especially considering the related statistics. According to the U.S. Consumer Product Safety Commission (CPSC), between 1990 and 2006, approximately 44,870 older adults experienced elevator-related injuries severe enough to warrant a visit to the hospital. Despite these statistics, “We want to stress that elevators are a safe form of transportation for elders,” says Greg Steele, DrPH, MPH, an associate professor of epidemiology in the department of public health at the Indiana University School of Medicine. However, healthcare practitioners must communicate to their older patients the hazards associated with this mode of transportation. In a recent epidemiological study, Steele and Joseph O’Neil, MD, MPH, an associate professor of pediatrics at Riley Hospital for Children at the Indiana University School of Medicine who studies preventable injuries, examined elevator-related injuries in older adults. Their study, which looked at the frequency and nature of these injuries, was published in the January issue of The Journal of Trauma: Injury, Infection, and Critical Care. O’Neil and Steele have previously published studies on elevator-related injuries in children as well as escalator-related injuries in older adults. The majority of these fall injuries resulted in soft-tissue injuries—namely sprains or bruising. Fractures, lacerations, and finger and toe amputations were the next most frequently recorded types of injuries. However, about 15% of the injuries Steele and O’Neil observed in this study were more serious, requiring hospital admission—a large proportion of which were for fractured hips. And while approximately three fourths of the injuries involved women, the overall injury rate was seven times higher in elders aged 85 and older. O’Neil emphasizes that three fourths of elevator-related injuries involved older women. More than one half of the older adults’ injuries were the result of a slip, trip, or fall, and about one third were the result of the elevator door closing on the individual. In addition to the problems created by the swiftness of today’s elevator technology, older adults often struggle with myriad physical issues influencing their mobility, including vision loss, hearing loss, and medications that may cause balance issues. Some debilitating injuries are also prevalent with elevators, although they’re not as prevalent among older adults. These types of injuries occur when individuals slip their hands between closing doors, attempting to open them. “The sensor may not be responding properly, and you may end up with abrasions or complete amputation of fingers,” Steele says. Hospitals, long-term care facilities, health clinics, and other locales where large numbers of older adults visit work diligently to ensure patents’ safety, regardless of age. However, there are some key techniques practitioners can use with their elder patients when it comes to elevator safety. Steele recommends applying different colors of paint to the edge of the room floor and the edge of the elevator compartment to help differentiate where the elevator compartment begins and ends. This is particularly important to help older adults identify misalignment issues when entering or exiting the elevator. Steele and O’Neil both say “Door Open” buttons should be made twice as large as the current standard size in most elevators to allow for swift identification and accessibility by individuals in the elevator who are trying to prevent the door from closing on those approaching the elevator or on older adults who are placing their walkers between the doors ahead of themselves. The researchers have recently learned of a company considering placing reflective devices at certain heights on the walkers they manufacturer to allow them to project a reflection to the elevator sensors. Another company that creates sensors for elevators is looking to provide a wider beam so it will detect a walker, cane, or other device that will be recognized before an older adult enters an elevator. Carol Story, RN, BSN, RAC-CT, clinical services director at Risk Management Solutions, a healthcare consulting firm headquartered in Columbus, Ohio, and comprised of clinical professionals with expertise in all facets of the risk-management field, including long-term care, acute care, rehab, home health, behavioral health, and other healthcare environments, recommends that administrators at long-term care facilities, assisted-living centers, and other residential communities servicing older adults educate residents about basic elevator safety. Story stresses that the most important measure of success in elevator safety is educating older adults and raising their awareness of the true risk of elevator-related injuries. For facilities housing cognitively impaired residents, measures should be in place to prevent their unassisted use of the elevator system, such as making adjustments to the elevator controls by coordinating the elevator service with a wandering-prevention device. Another method is adjusting access to the elevator call buttons by installing a clear enclosure with a small opening for calling the car. For healthcare providers working in nonresidential settings, patient communication is paramount for reducing elevator-related injuries. Both Steele and O’Neil stress the importance of talking with older adult patients about the risks elevators pose. “This is especially important when prescribing medications that may affect their vision or balance. As they get older, communicate to them that they are more susceptible to balance problems, medication issues, vision reduction, and footwear problems,” O’Neil says. And for those who may be ushering older adults into or out of elevators, they should pay particular attention to helping them exit or enter safely. Although both Greg Steele, DrPH, MPH, and Joseph O’Neil, MD, MPH, emphasize that elevators provide a safe form of transportation for elders, they strongly discourage older adults from using escalators. Here’s why: In their study on escalator safety published in the March 2008 issue of Accident Analysis and Prevention, the researchers found that the number of escalator-related injuries suffered by older adults more than doubled, resulting in nearly 40,000 elders being injured on escalators between 1991 and 2006. Balance issues, vision issues with the moving floors, and difficulty stepping on or off the escalator resulted in numerous falls, trips, and serious injuries. “Elevators are still the way to go for older adults,” Steele says. In their escalator-safety study, Steele and O’Neil saw older adults wearing improper footwear or carrying too many packages onto the escalator, causing them to lose their balance and fall. • Make your patients aware of safety practices associated with operating and using elevators. • Remind patients with mobility devices such as walkers and canes to be particularly alert and cautious when using elevators. • Use different colors of tape or paint to call attention to the alignment of elevator cars and adjacent floor surfaces. • Use colored tape or a large-print sign to call attention to an elevator’s “Door Open” button. • Take steps to prevent cognitively impaired patients from operating elevators alone.